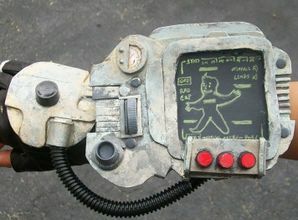 The first Pipboy in widespread use was a right-handed model only and was extremely heavy to wear. However, it did come with a seemingly endless supply of chalk and was fairly simple to use, making it suitable for use by even the most 'challenged' of heroes. Unfortunately, this model had only limited functions, and was notable mainly for showcasing their poor drawing skills. As the vital signs function depended on the hero being alive to update the display, the statistics were not always readily available, or even reliable. The map function also required the hero to have some knowledge of the local area, although their ability to find their way to any local tavern town without any aid at all is almost legendary. One unfortunate downside to this device was the probability of getting killed while laboring over the display updates, although the occasional monster has been known to sit and watch, and even offer helpful advice to the hero on current locations and vital statistics such as "You are here" and "You'll be dead in a minute". This page was last edited on 25 January 2019, at 00:40.